The Scope & Sequence report prints out the information entered into the Topic field, therefore, the Topic field must be enabled in order to utilize this report. In the Lesson Plan version of this report, you can print out the Topics for one Lesson Plan at a time. 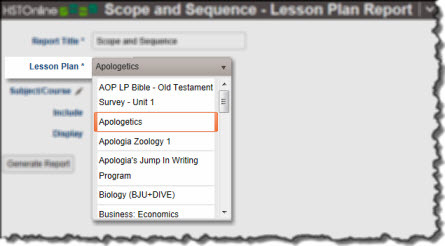 You can choose specific Subjects/Courses in that plan, or print for all Subjects/Courses in the Lesson Plan. 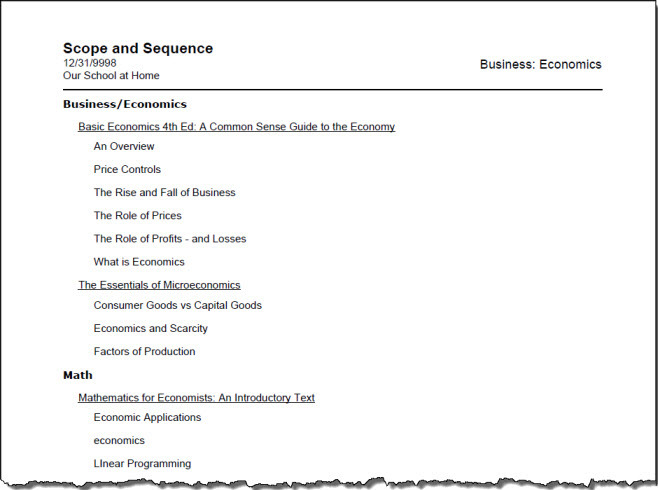 Topics appear in alphabetical order. The default name for this report is: Scope & Sequence. You can change the Report Title to anything you like, up to 150 characters. Select a Student from the drop down list. The Resources report can be created for one Lesson Plan at a time. Click the Subject/Course hyperlink to choose which Subject/Courses you want to run the report for. Click the 'Both' radio button at the top of the selection window to display Archived Subjects and Courses for selection. If you choose multiple Subjects/Courses, Topics will be grouped by each Subject/Course with the Subjects/Courses appear in alphabetical order. Resource Name: Within each Subject/Course, Topics will be grouped under the Resource which is tied to that Lesson Plan item. Resources appear alphabetically. Topics tied to Lesson Plan items with no specified Resource will appear first. 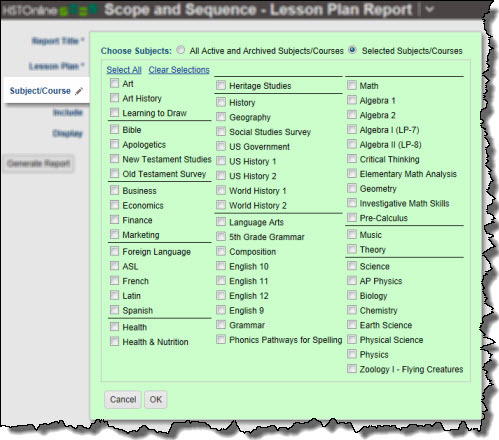 On the HSTOnline menu, click or touch 'Scope and Sequence - Lesson Plan' under the 'Reports' section.